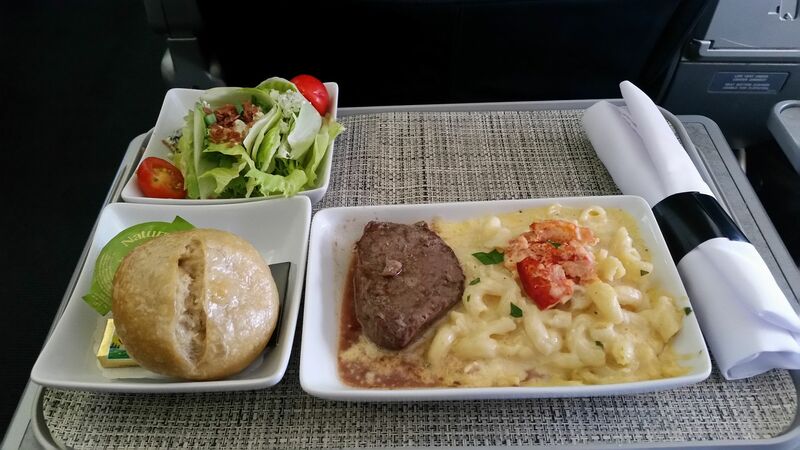 American Airlines First Class: What’s For Dinner? In September 2014 American and legacy US Airways harmonized their catering — and the results were not good. American took the overwhelming feedback of customers — and from embarrassed crew — to heart and introduced better meals in August 2015. American ostensibly introduces all new meal service each year. We got a new set of meals in November 2016, and last month they began to rotate new dishes in as they overhaul the domestic first class menu. In December they introduced Buratta Cheese Ravioli with tomato garlic sauce and roasted cherry tomatoes and this month they introduced Chicken Meatballs with Creamy Polenta, Porcini Mushroom Tortellini, and Beef Short Rib with Twice Baked Potato. That means dinner entrees have been half replaced, with four of last year’s items still on the menu. The dinner items are all designed in consultation with Celebrity Chef Julian Barsotti. American refreshed breakfast in fall 2016 and is now updating again. December saw the introduction of three new breakfast items: Breakfast Sandwich wit Egg; Smoked turkey, Colby jack cheese on ancient grain flatbread; Montamore Cheese and Kale Pesto Omelet; and Smoked Fontina Cheese and Peppadew Omelet. If you’re booked in domestic first class at least 24 hours prior to departure you can pre-order your choice. Meal choices appear one month prior to flight. You can also select a fruit and cheese plate instead if you prefer. International flights and premium domestic flights between New York JFK and both Los Angeles and San Francisco receive different menus. Yep, but no crackers with the ‘optional’ cheese plate. Poblano peppers stuffed with manchego, queso fresco, Monterey jack, cotija with piquillo crema and cilantro rice – one of my favorite. “Celebrity Chef Julian Barsotti” lol if you have to google who he is, then probably not a celebrity chef. Maybe a Dallas celebrity chef? As a picky eater, all but two of those (the chicken and filet) make me gag. Horrible menú for first class. Well thats also why this airline is not in the top.ten airlines.cheesy menu redneck style. Bring a jackhammer to cut the beef.